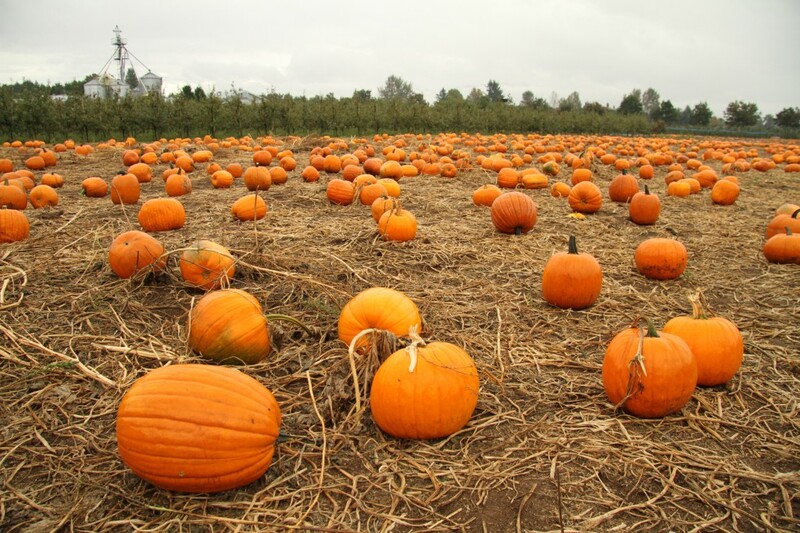 A trip to the pumpkin patch is one of my quintessential fall experiences. 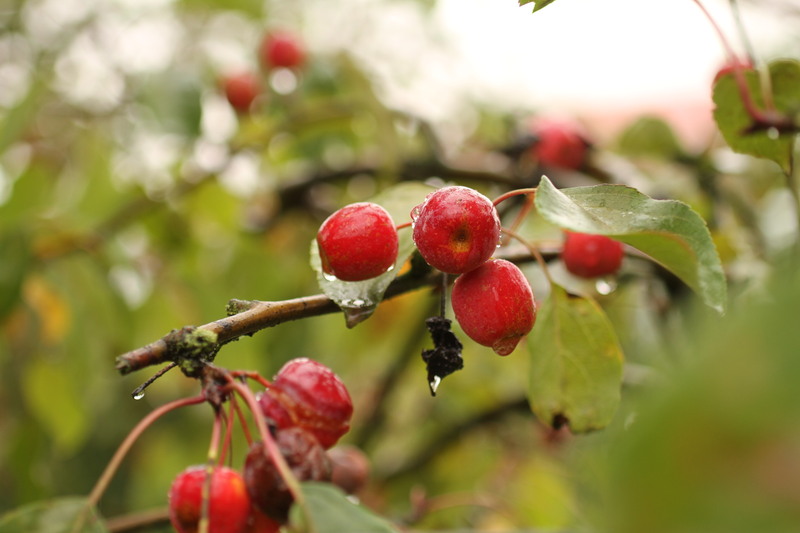 It’s the perfect excuse to head out into the countryside and fully embrace the season: the warm colours of the foliage, the foggy mornings, the earthy smell of the air, the comfort food and of course, the harvest! 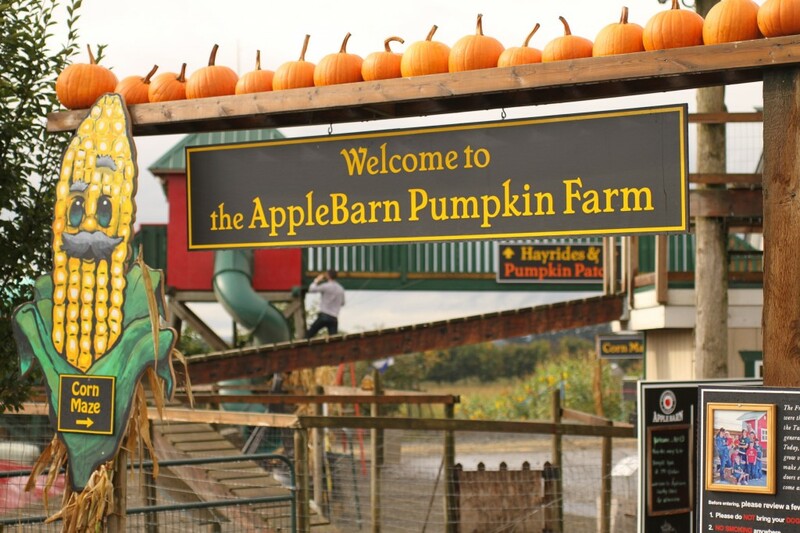 So when I was invited out to the AppleBarn Pumpkin Farm at Taves Family Farm in Abbotsford, I knew it was the perfect opportunity for my autumn escapade. I brought along my friend Blake who, having moved to Vancouver from Australia last November, had yet to experience our Canadian autumn traditions. Pumpkin patches? 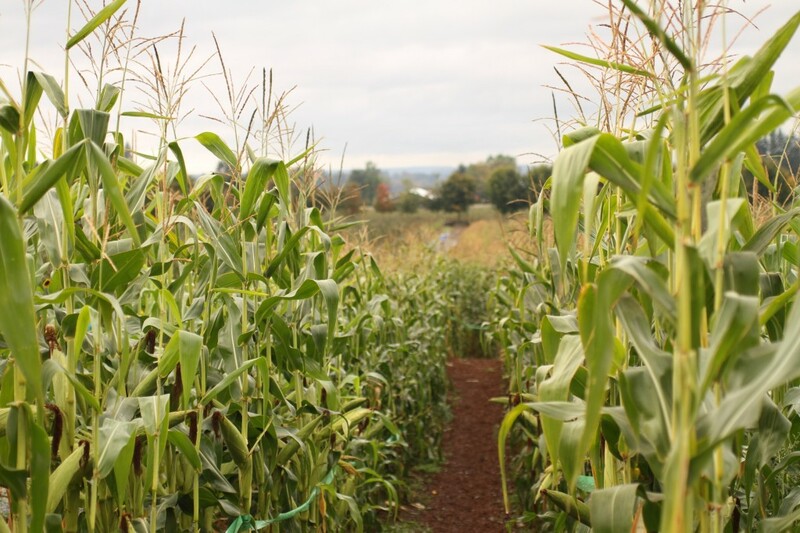 Corn mazes? Hay wagon rides? It was all new to him, and I thought this would the perfect crash course for him. He seemed game, despite the rain, and so with rainproof clothing and a bunch of cameras in hand, we set off for the hour drive east of Vancouver to Abbotsford to the heart of the Fraser Valley. 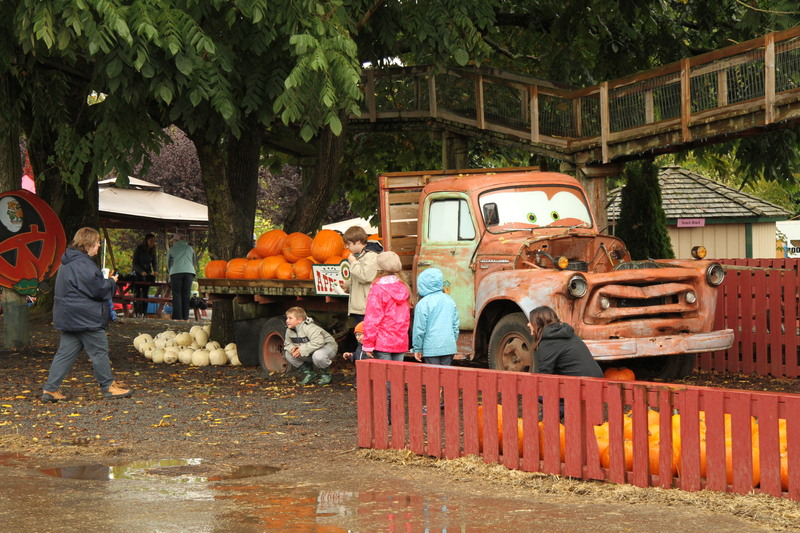 The AppleBarn Pumpkin Farm is a Fraser Valley institution. 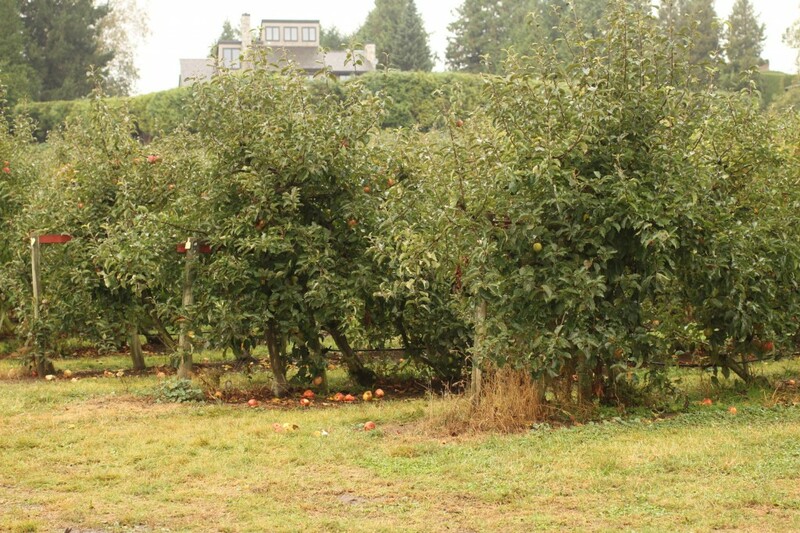 Located in the southern reaches of Abbotsford in the lush countryside, the Taves family has been farming here since the 1930s. 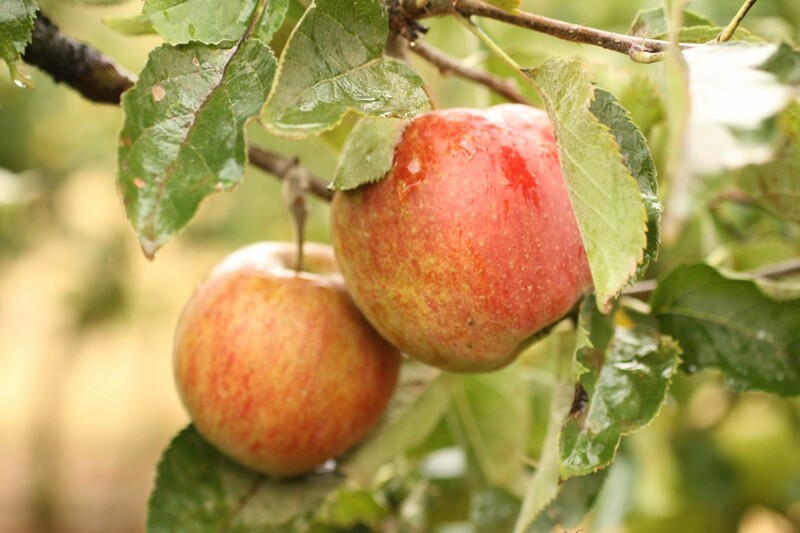 Starting with apple orchards, they’ve since expanded to growing pumpkins, corn, and even heirloom tomatoes! 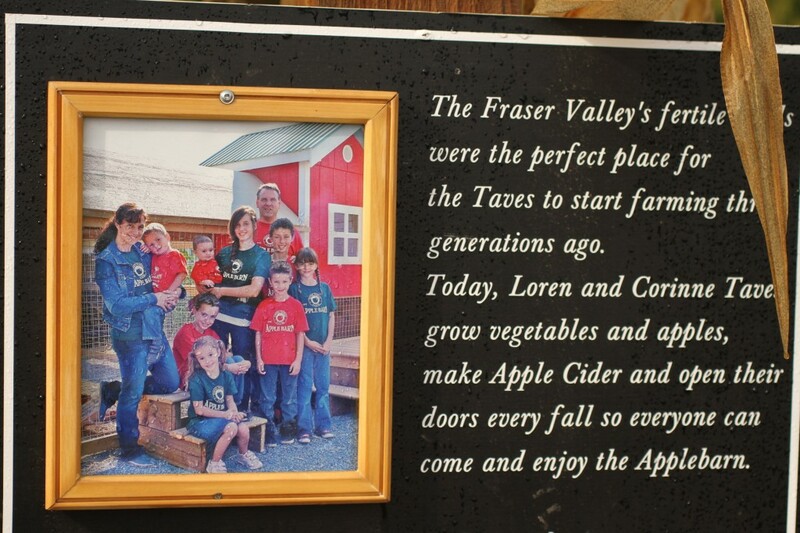 Three generations later, the Taves have opened their family farm to the public for everyone to enjoy. Upon arrival, we were greeted by Loren Taveshimself. We learned quite quickly that this isn’t just a family farm in name, it was, quite literally the homestead of Loren, his wife Corinne, and their eight (yes, eight!) children who were seen around the farm playing, helping out, and simply enjoying life. You seriously can’t get more family-friendly than this. 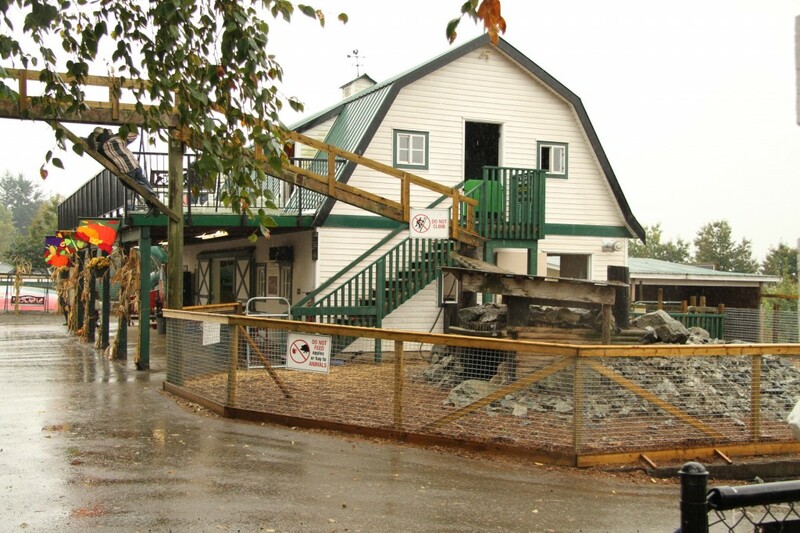 First stop was the AppleBarn Country Store. It’s here where they sell their apples and seasonal produce like eggplants, tomatos, and peppers. 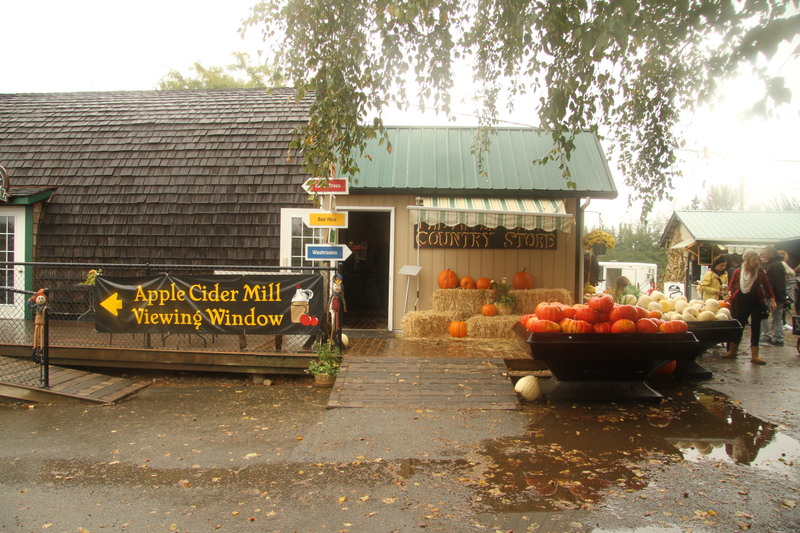 They sell their fresh-pressed apple cider which is pasteurized using a UV filter which maintains its freshly-pressed flavour. 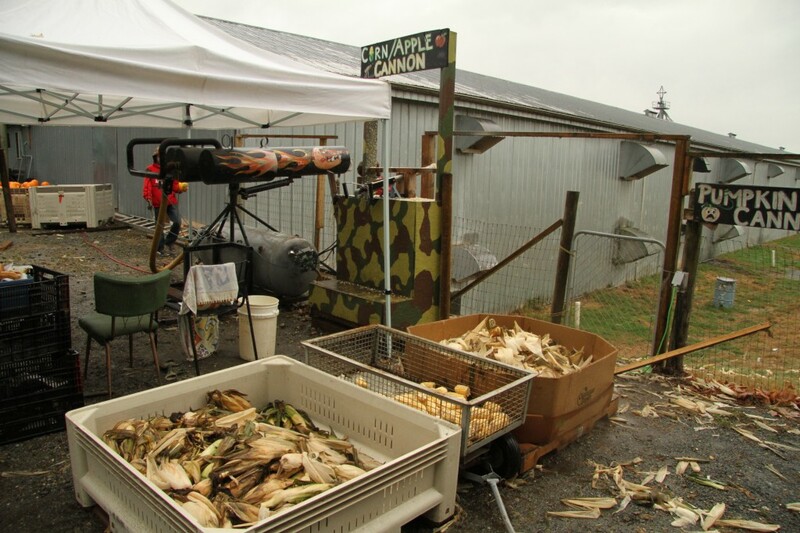 They also sell variety of treats and goodies, including the most delicious caramel apples! 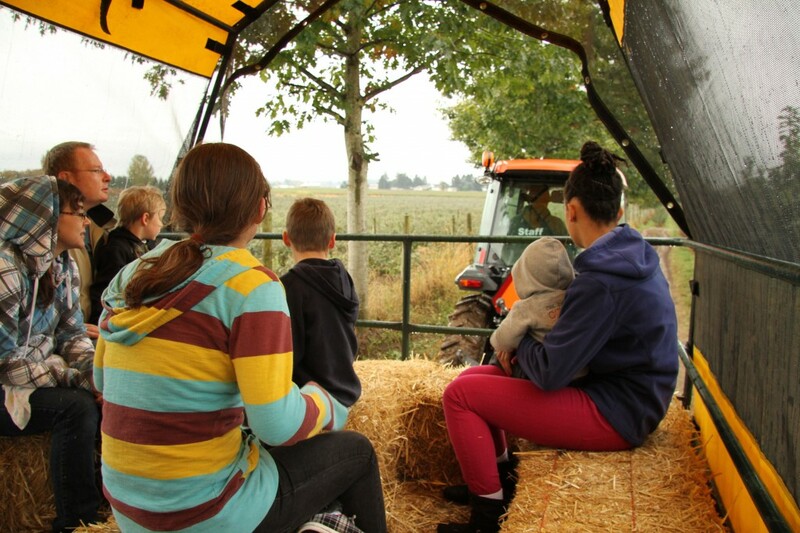 Loren told us that school groups frequently visit the farm, so they’ve set up various education stations throughout. 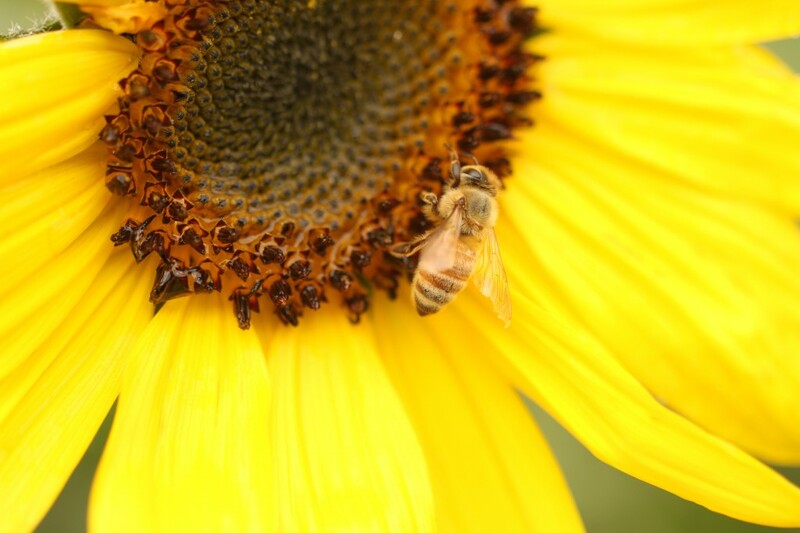 Kids can learn about various aspects of the farm such as bees (there’s a glass-encased bee-hive where you can watch the bees in action), the life cycle of the apple, and how the apple cider is made (you can watch the apple cider-making area through a glass window). 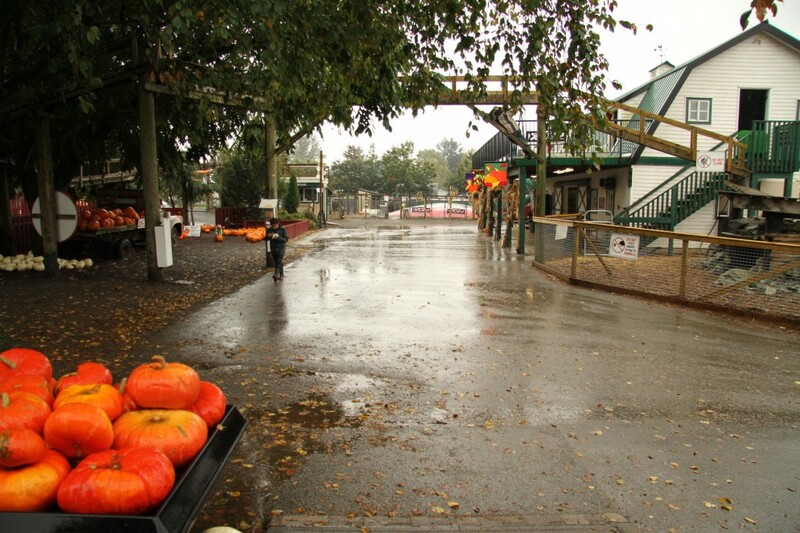 All throughout the AppleBarn Pumpkin farm are whimsical decorations and farm equipment. The whole place has a fun atmosphere. And it was here, around the Country Store where we took covered hay wagon ride out to the middle of the farm. 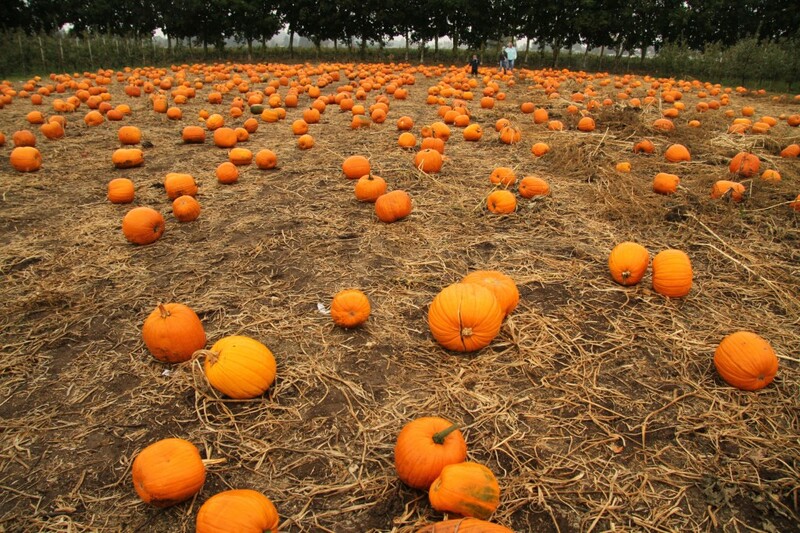 The ride took us through the corn fields and apple orchards, making a pit stop at the pumpkin patch. 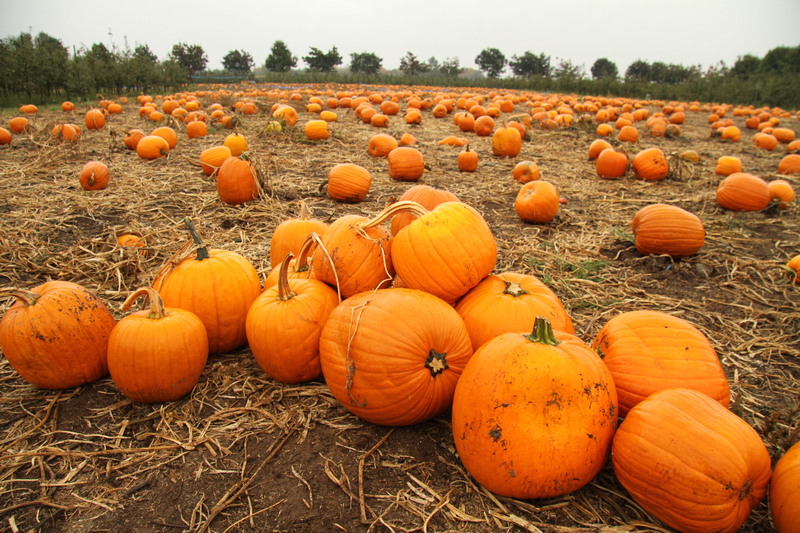 Even though we weren’t planning to pick any pumpkins, it was just fun to be there and bask in the whole surrealism of it all. 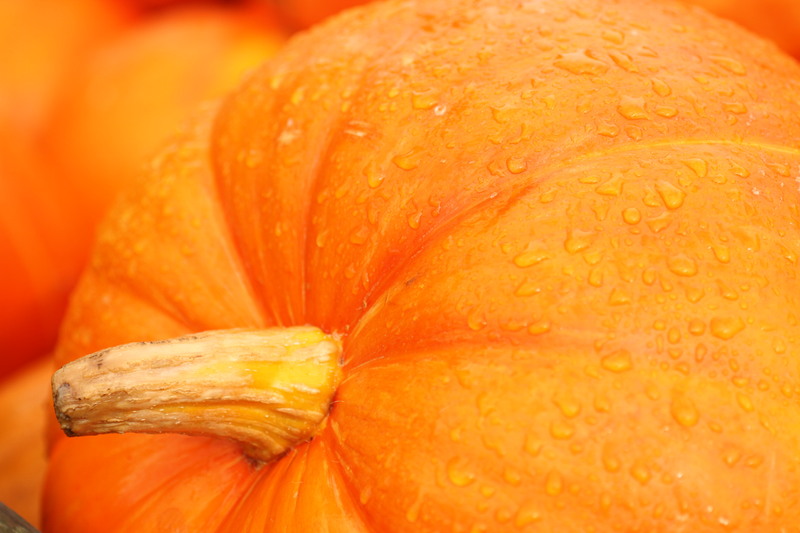 The rain started to fall as we were out admiring the pumpkins, so we decided to head back. 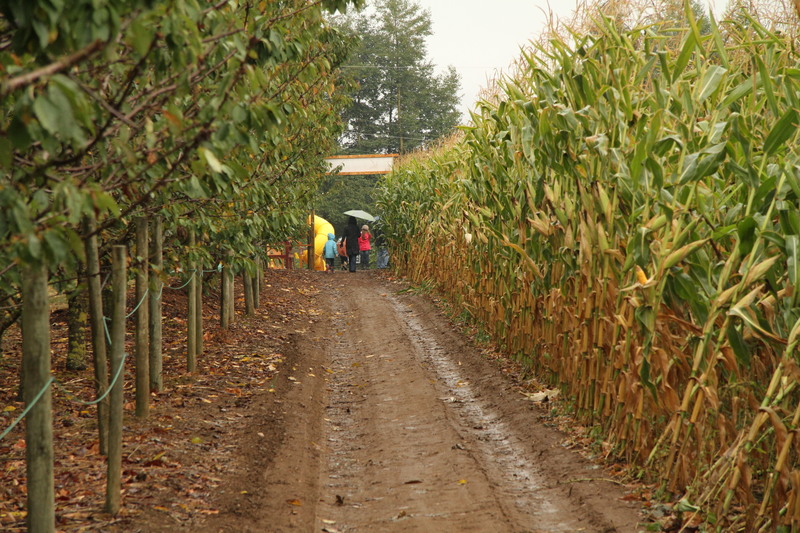 Rather than wait for the next hay wagon ride, we decided to stroll back to the farm past the corn fields. 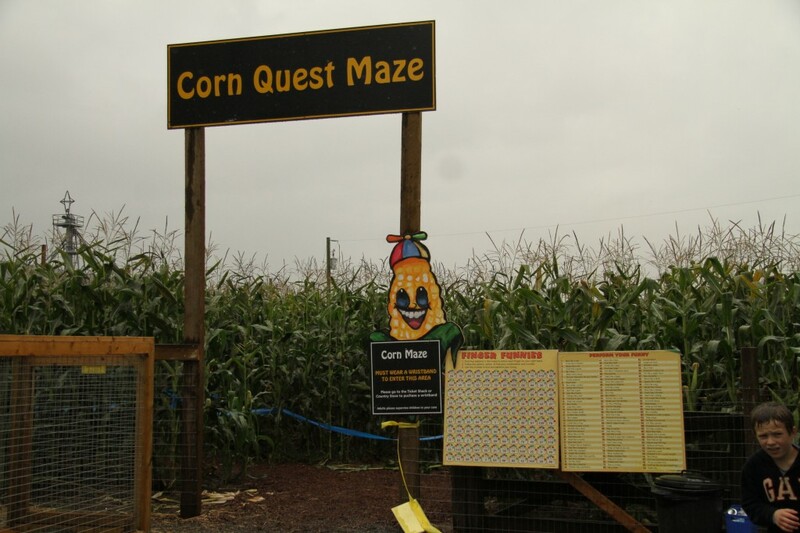 It turns out that the corn field we had been walking past was the outer wall of the Corn Quest Maze! 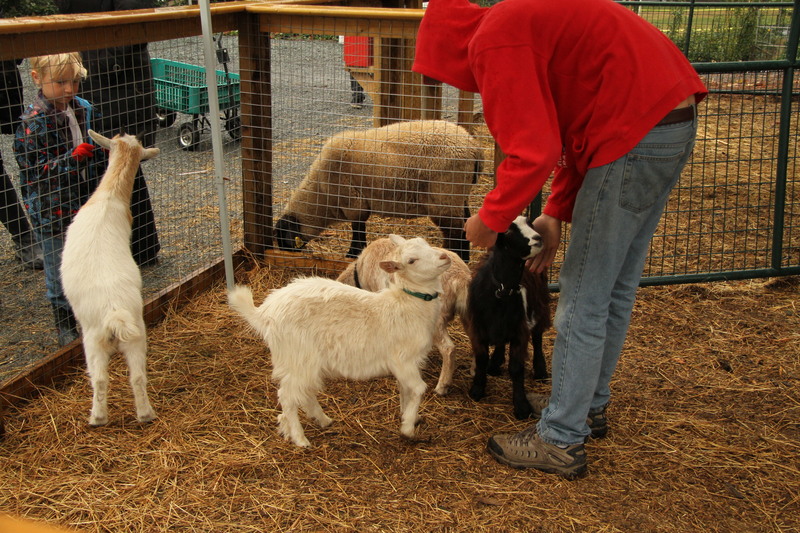 While the corn maze was tempting, it had started to pour rain, and the goats at the petting zoo were luring me over. 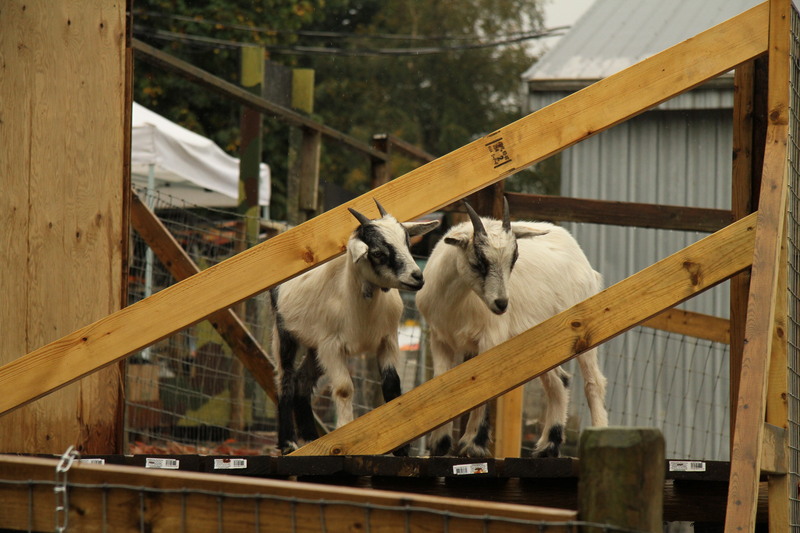 These goats were curious fellows and seemed to have a whole network of platforms and elevated walkways at their disposal. When I was taking this picture, a staff member was fixing their fencing with a power drill, and they simply stood there watching him work away. 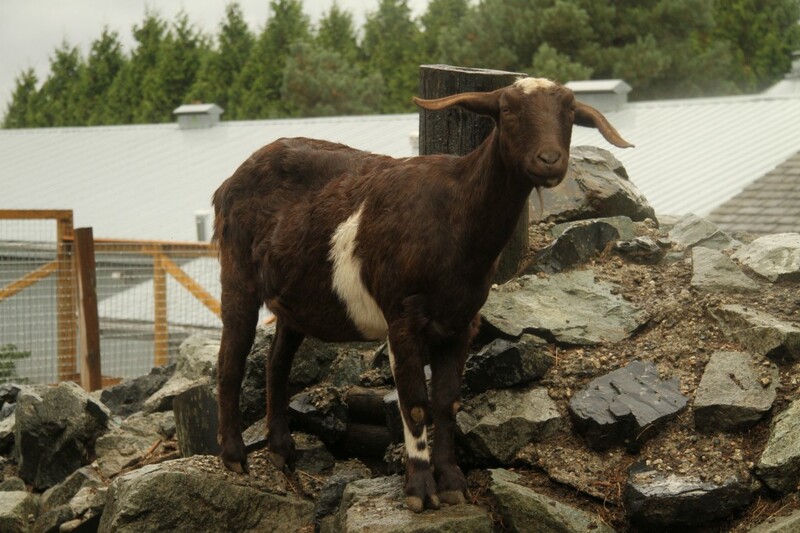 Other goats, like these guys, were friendly with the visitors who came into their pen to say hello. 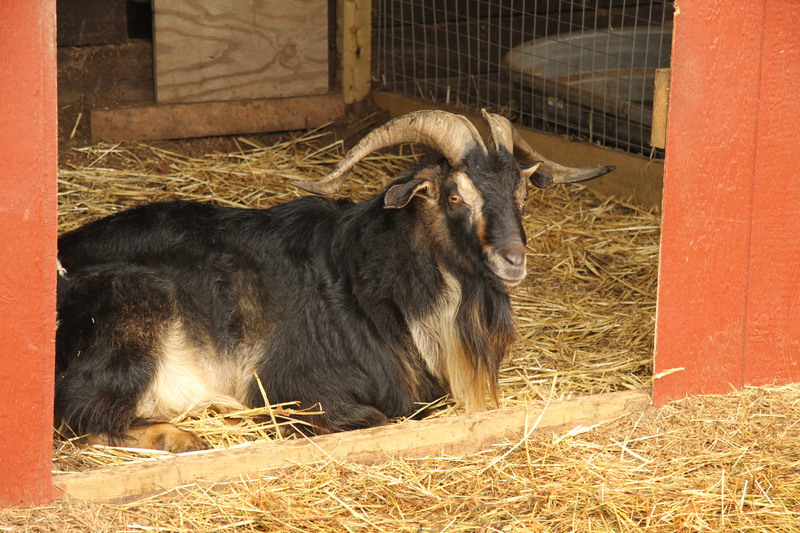 And then there was this rather beautiful bearded fellow! 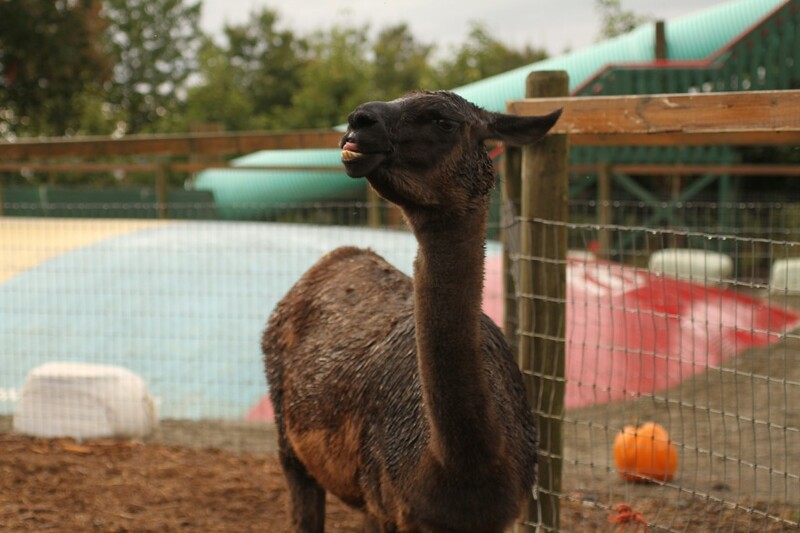 Also nearby were turkeys, ducks, and geese, all in their respective cages. 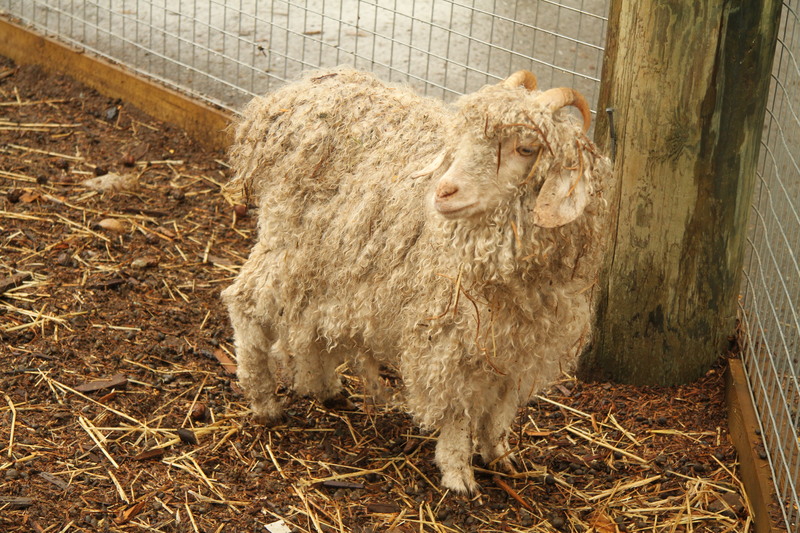 The petting zoo was something I knew about prior to my visit, but I certainly didn’t know about this! 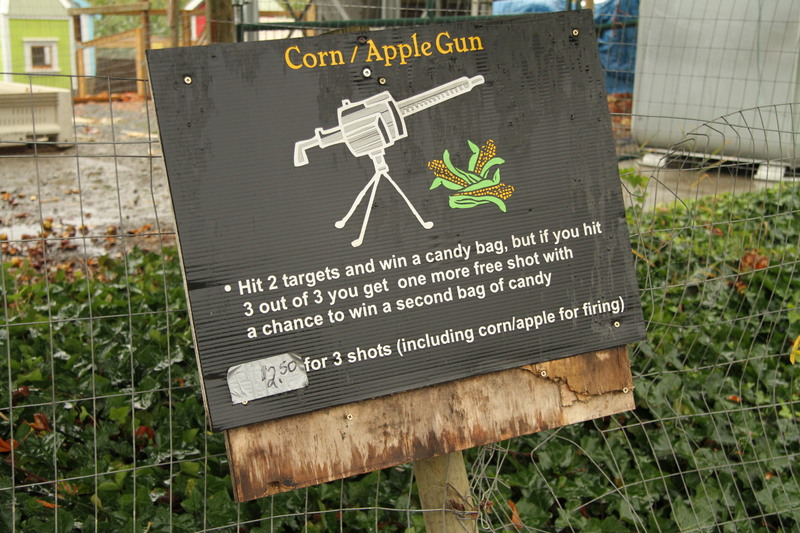 We seriously couldn’t believe there was a corn/apple gun on site and were curious to see it in action. 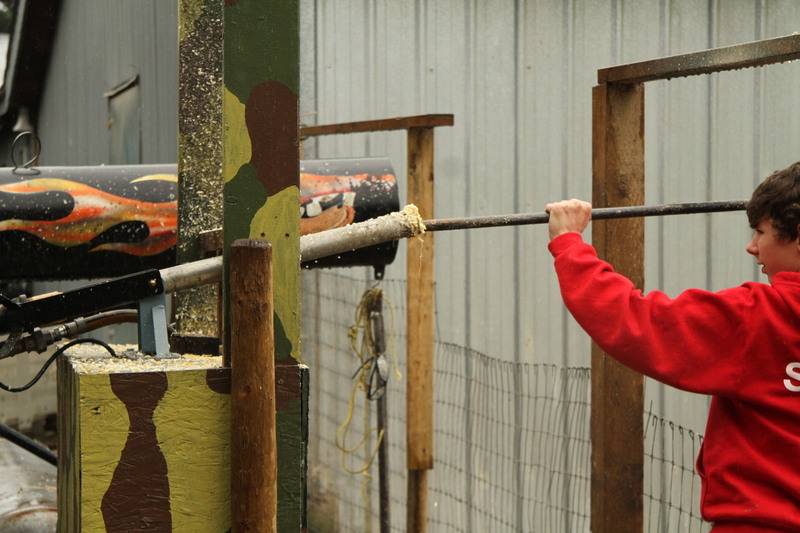 The boys working here (who agreed that they have the coolest job on the farm) would stuff an ear of corn into the barrel of the corn gun and then push it in with a pipe. 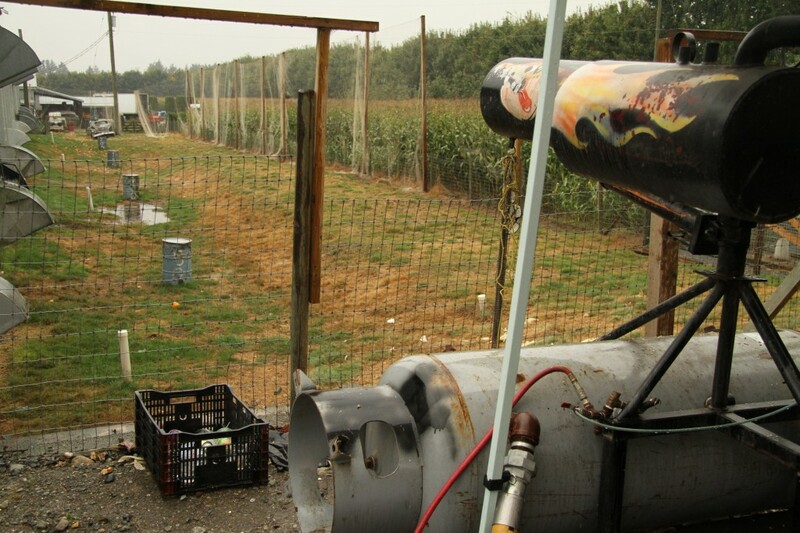 They then shot the corn across the yard, aiming at the barrel targets. It was pretty funny to see because it’s just so absurd. 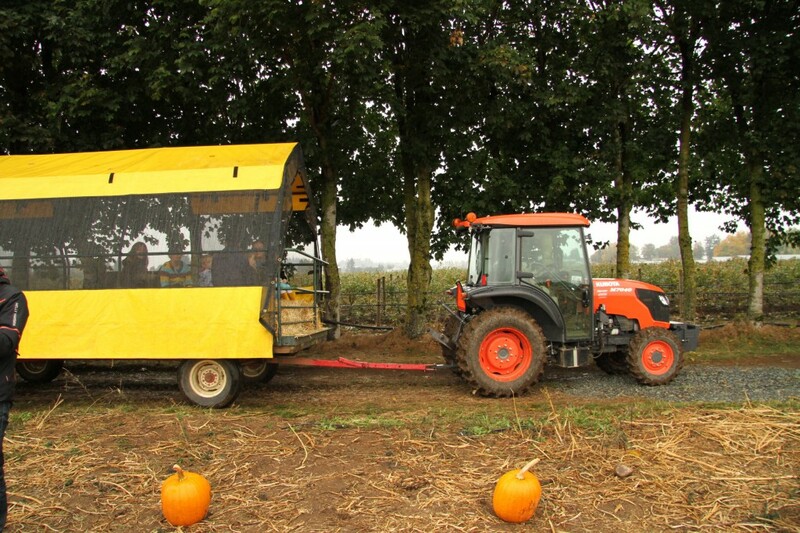 While the corn gun was pretty cool, you had to see the pumpkin cannon in action! 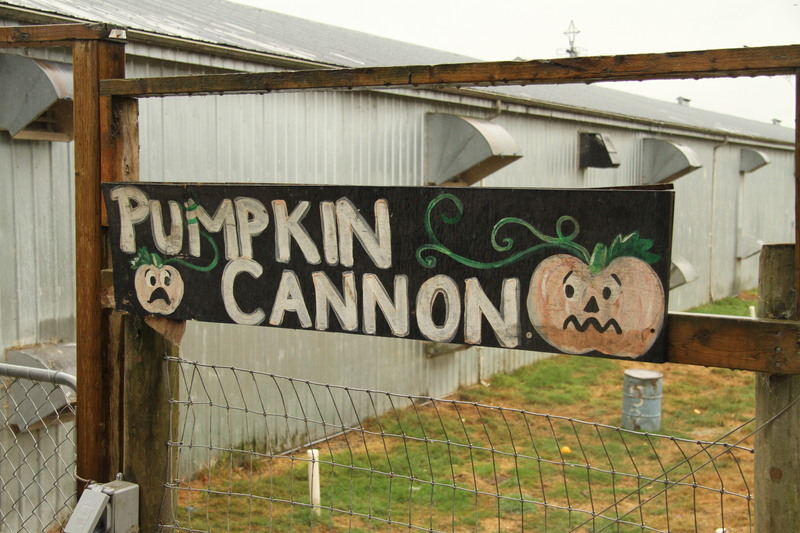 Unlike the corn gun, the pumpkin cannon was a massive piece of artillery. They shove a pumpkin into the cannon, and just before setting the thing off, they ring a little dinner bell to alert the nearby horses so that they can anticipate the big noise. While I didn’t catch it on camera, there was something delightfully ridiculous about shooting a pumpkin across the land for no real purpose other than for fun. And then to see it explode into a million pieces next to an old junkyard truck was rather grand. 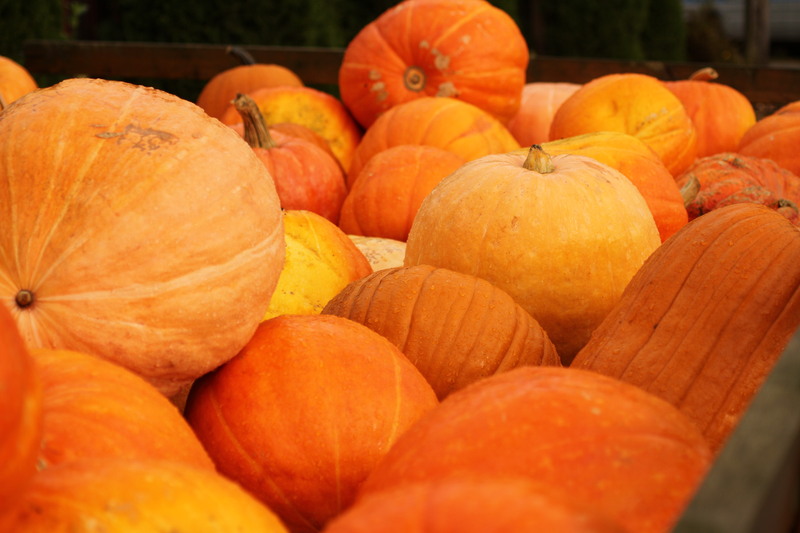 For those who don’t want to make the trip out to the pumpkin patch, you could simply pick up a pumpkin from the many bins around the Country Store. 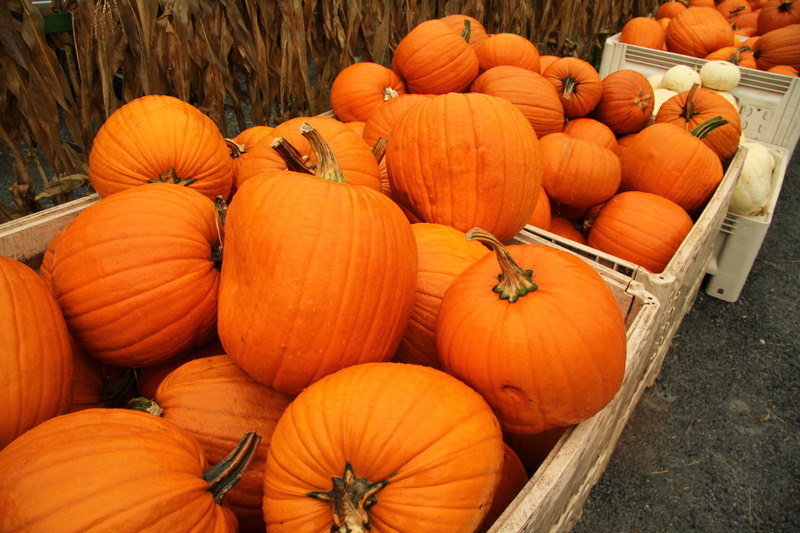 There were big bright orange pumpkins, smaller reddish-orange pumpkins, and even white pumpkins! 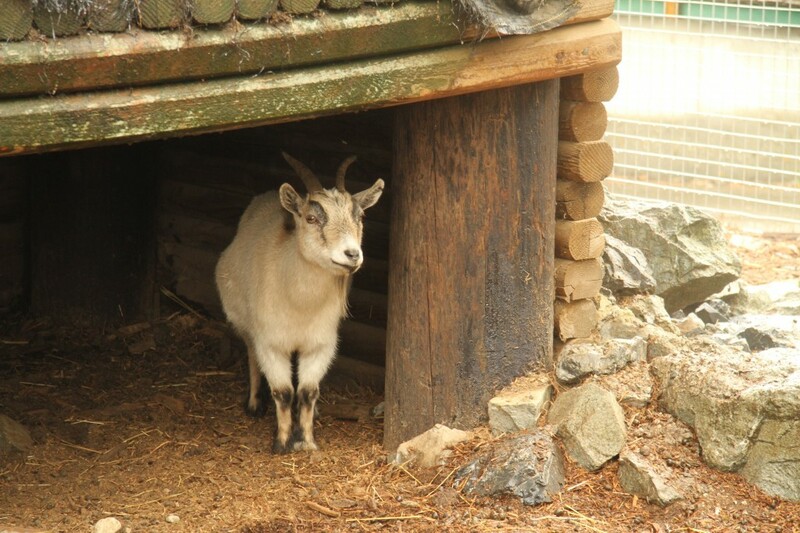 While it had been raining steadily for the hour that we had been at the farm, there was plenty of shelter and indoor spaces for one to escape the rain. Loren brought us over to the barn which was converted into a petting zoo themed as an animal village, complete with pigs and bunnies. 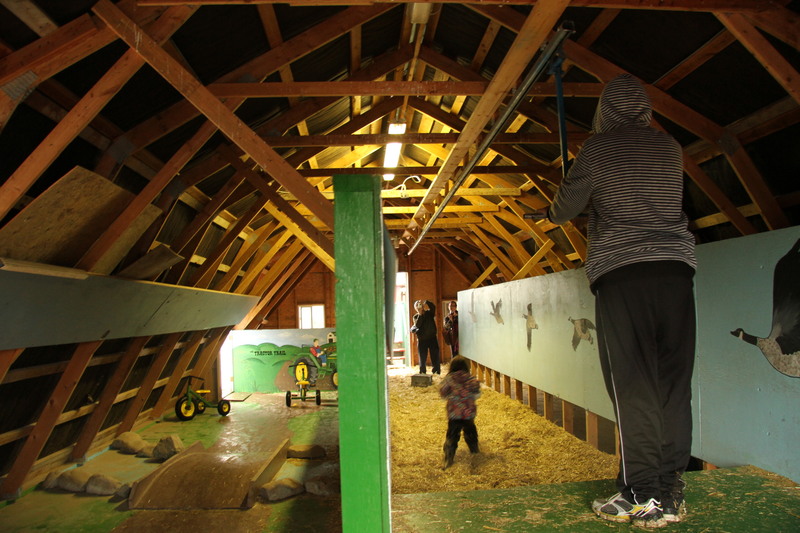 Upstairs in the barn loft was a play area for young kids where they could ride a tricycle through a course, or take the zip-line from one end of barn to the other. All I know is that if I was 5 years old, this would be my favourite place to come to! 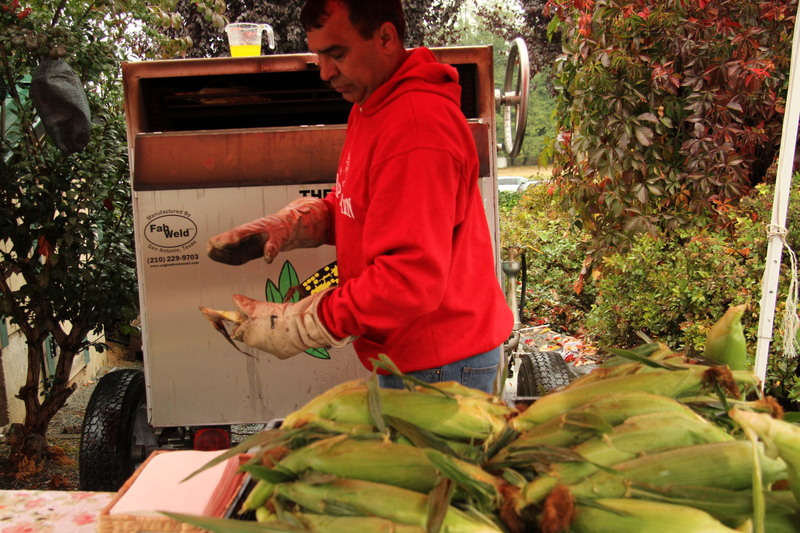 Back outside, we noticed a metal corn roasting machine with a man working diligently at preparing the corn. 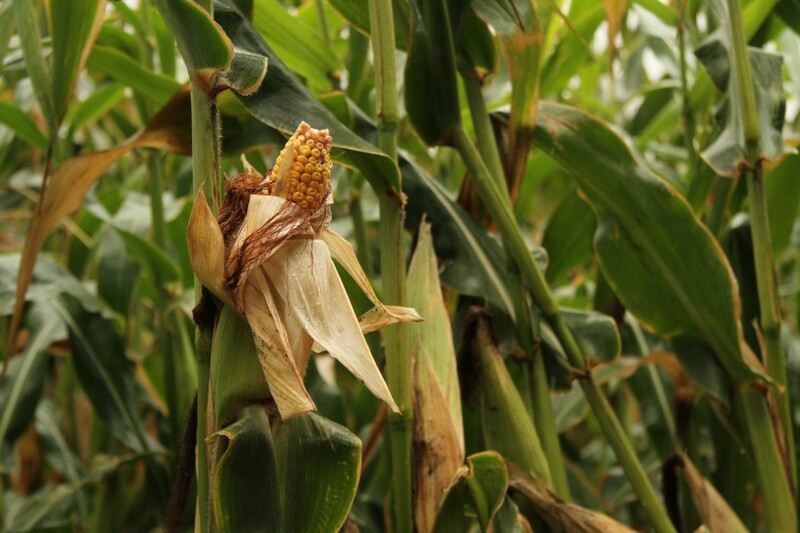 The corn is slow-roasted in its husk which gives it a beautiful flavour. Pour a bit of butter and sprinkle some salt, and you’ve got some of the sweetest, most delicious corn you’ll ever taste! While we were enjoying our corn, Loren asked us if we wanted to check out the greenhouses. 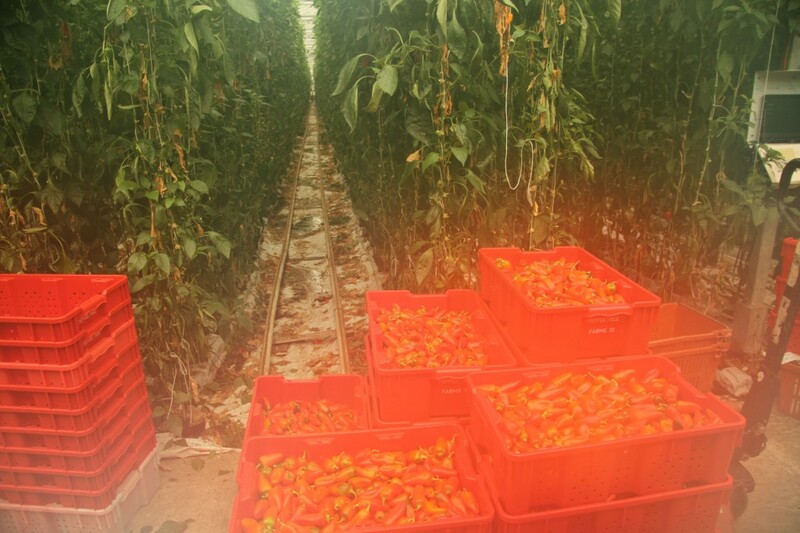 Located down the road, these greenhouses aren’t normally open to the public, but we were given a special tour so we could see how they grow their sweet peppers, heirloom tomatoes, lettuce, and eggplants. 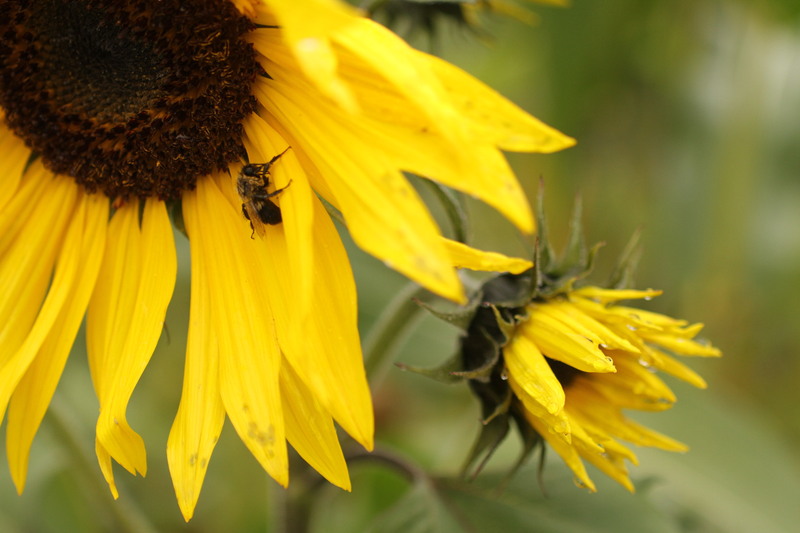 Unfortunately my camera lens started to fog up due to the warmth and humidity in the greenhouse, so I didn’t get as many photos as I wanted. However, it was incredible to see such a large commercial greenhouse in action. 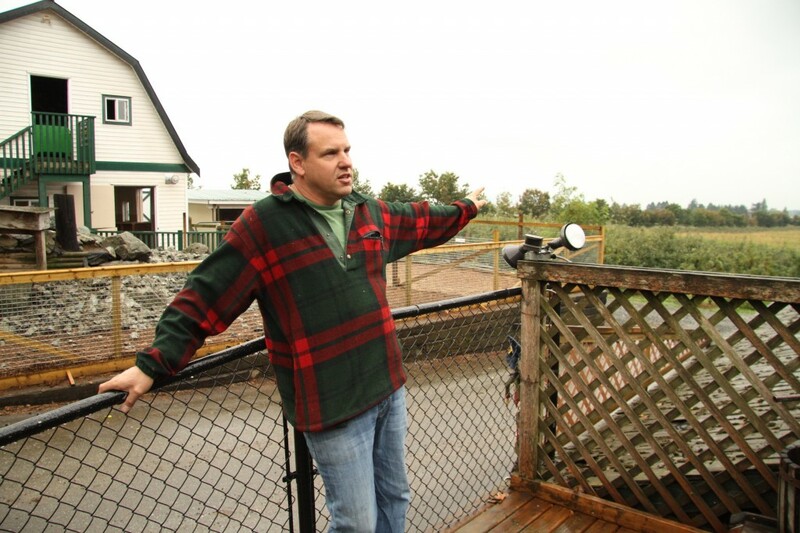 4 acres in size, Loren said that this greenhouse is actually considered small in comparison to the more large scale farms. Walking into the greenhouse, it was incredible to see these tall pepper vines reaching the ceiling and smelling the sweet aroma of peppers. 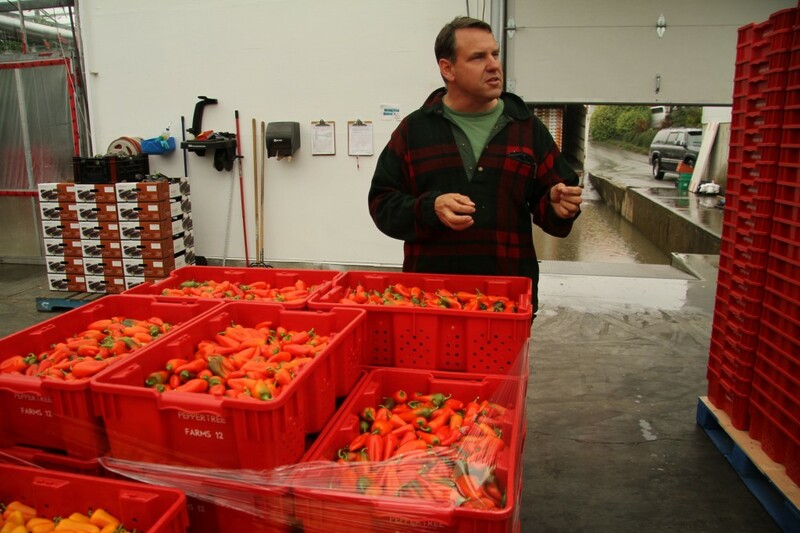 Loren explained that they sell these peppers will likely end up at Costco, however Costco will only take peppers a certain size and shape. If the peppers aren’t to the exact proportions, they’ll take those peppers and sell them at the local farmers markets. 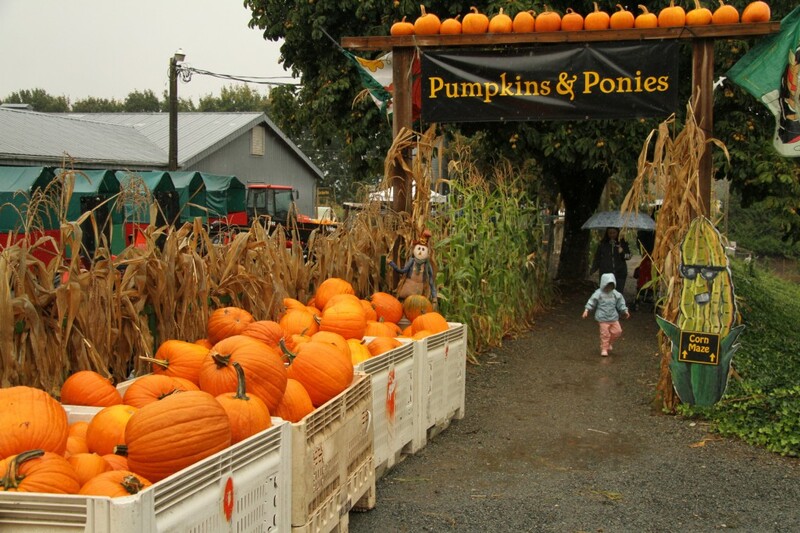 That’s actually how I first encountered the AppleBarn Pumpkin Farm, this past summer: at the Trout Lake Farmers Market. I bought one of their cloth bags and a bunch of eggplants… so it was really cool to see those eggplants growing. I also learned something about eggplants. Eggplants grow so fast that they’ll go from blossom to fully mature fruit in the span of two weeks, to the point where they have to snake the vines back and forth to make room for new growth! In addition to the peppers and eggplants, we saw tomato vines of all kinds: speckled green and yellow heirloom tomatos, large red beefsteak tomatos, tiny golden cherry tomatos, to name but a few. There were also foam floats of lettuce seedlings on a unique system where the lettuce plants float down a nutrient-rich water canal in the greenhouse. By the time they get to the end of the canal, they’re ready for harvest. 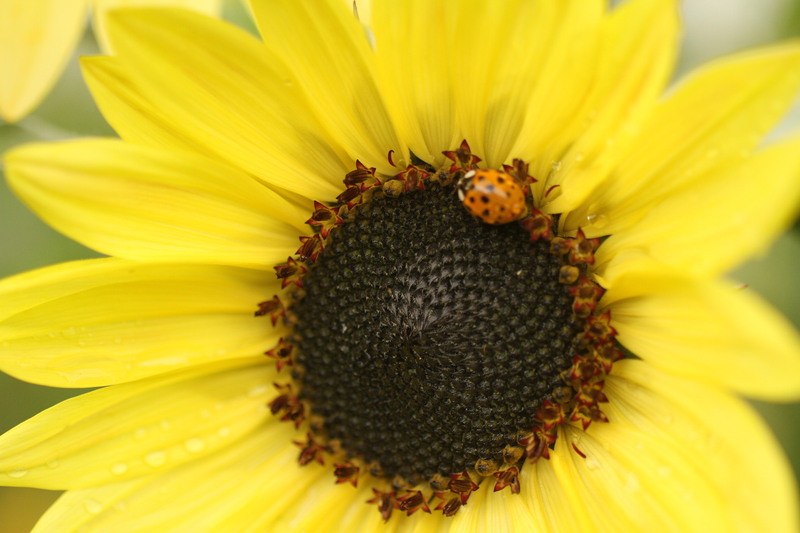 All the produce grown in the greenhouse grows from natural light. The soil used is, I believe, a type of cocoa fibre. At the end of a growing cycle, rather than dispose of the soil in a landfill (as many greenhouses apparently do), they painstakingly take the plastic casing off the individual soil pods by hand, and then they use the soil in the pumpkin patches, which is fantastic. Outside the greenhouse was the Taves Family Farm’s U-pick apple orchard. 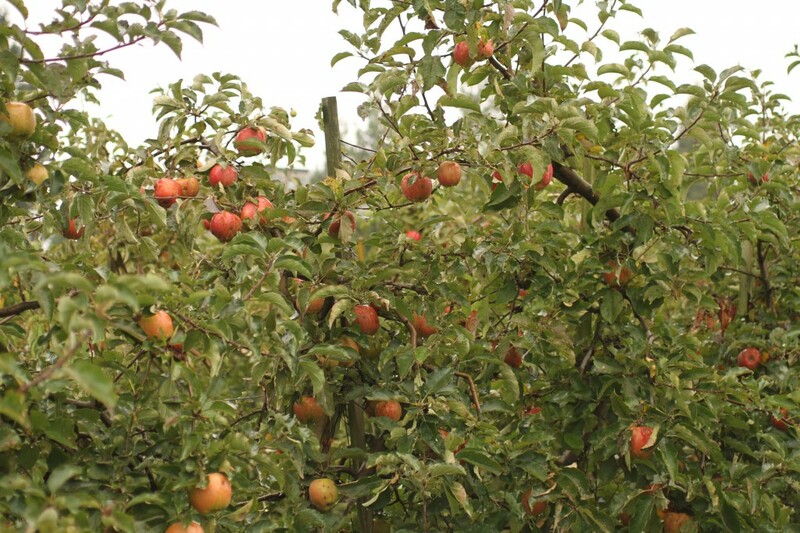 These particular trees were growing Jonagold apples, although earlier in the season you can pick other types, such as Gala and Fuji. The rain was gently drizzling but the atmosphere was beautifully serene. 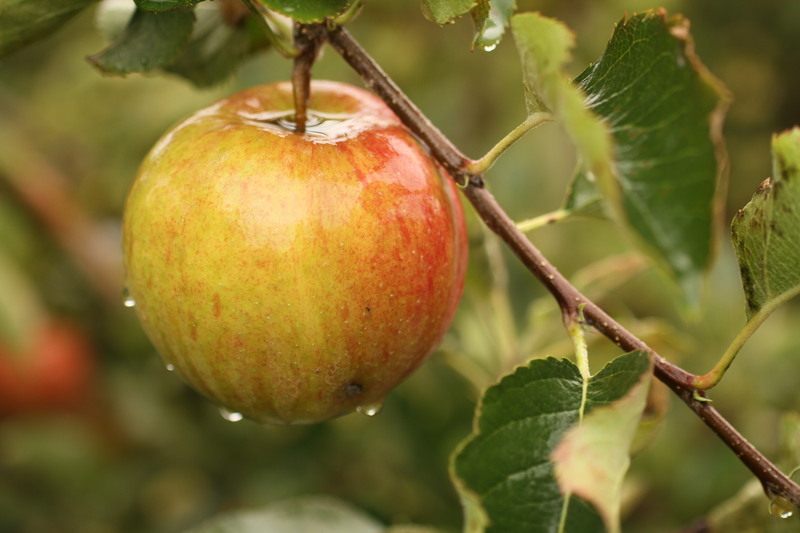 Although it was mid-October, there were still many apples on the trees. 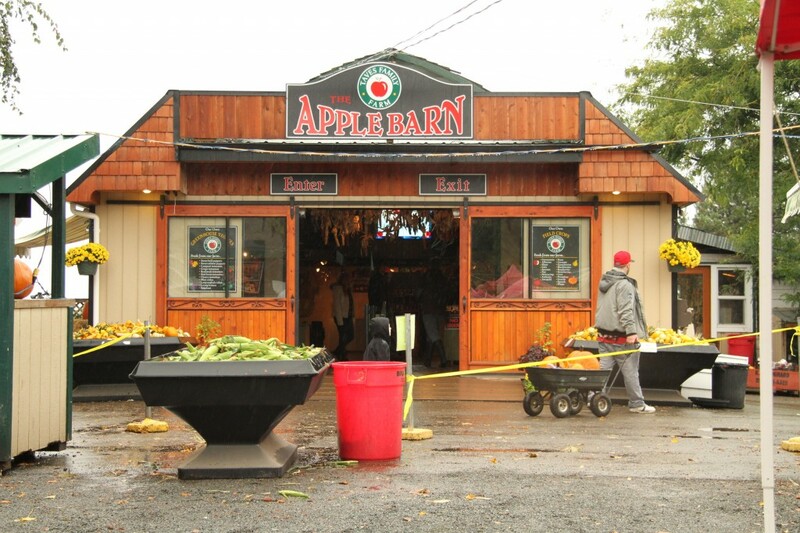 We returned back to the AppleBarn one last time. The rain had stopped and the place was getting busier. And just as we were on our way out, we meandered through the corn fields one last time and admire the scenery. 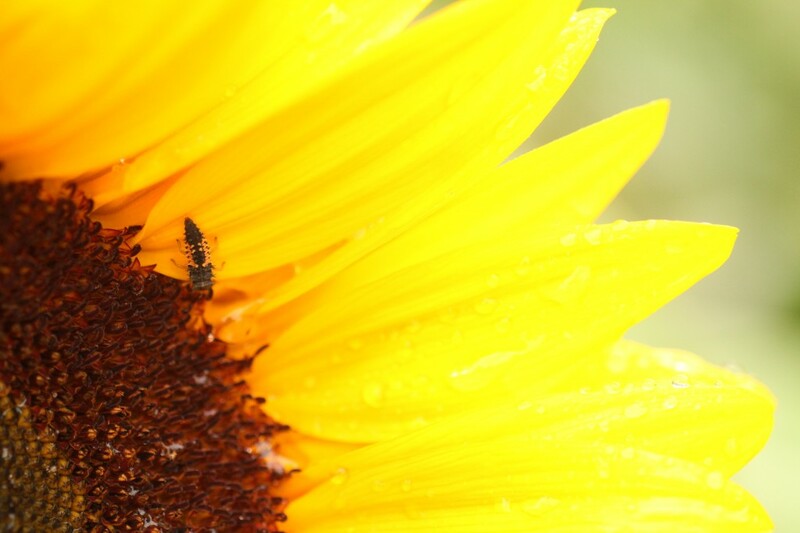 While enjoying the sunflowers, I noticed that every single flower appeared to have an insect taking shelter from the rain. 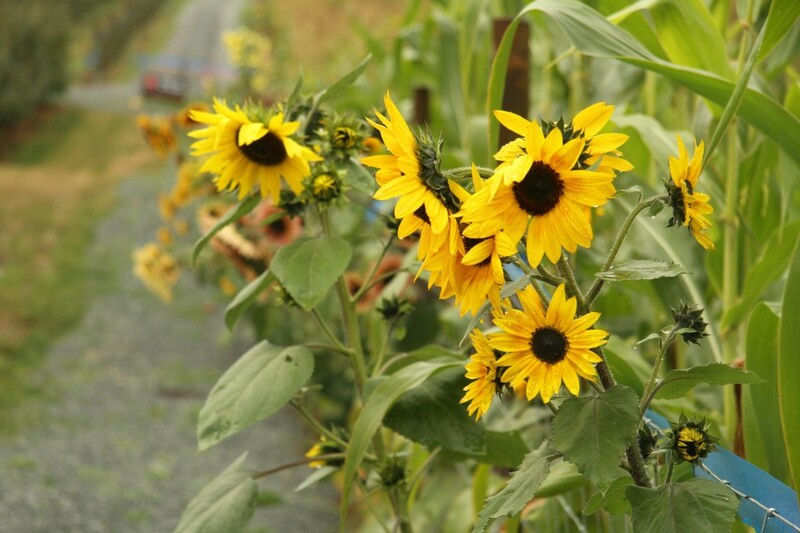 It was as if each sunflower had its own ecosystem… a fitting way to end our day at The AppleBarn Pumpkin Farm. A big thanks to Summer Dhillon and especially to Loren Taves for your warm hospitality that rainy Saturday afternoon!